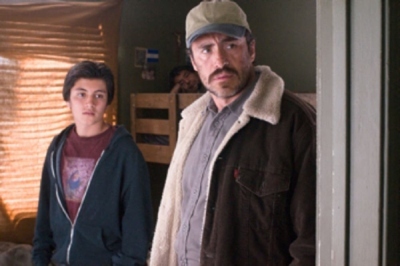 (L to R) JOSÉ JULIÁN and DEMIÁN BICHIR star in A BETTER LIFE. Every now and then a movie comes along that I can’t seem to stop talking about. “A Better Life” is one of those movies. Chris Weitz, director of “About a Boy” (2002) and “Twilight: New Moon” (2009) has risen to the top of his game with this simple, yet complex, story of an immigrant living in L.A. This single father’s sole purpose of working hard and long hours as a gardener is to provide a better life for his 14-year-old son. A well-respected and successful actor in Mexico, Demián Bichir, who plays the lead role (Carlos Galindo), may best be known in the U.S. as Esteban Reyes on Showtime’s hit series, “Weeds.” He also played a young Fidel Castro in “Che” (2008). The appeal and draw of this film is, in large part, due to the award worthy performance given by Bichir. His mesmerizing performance makes “A Better Life” all the more difficult to shake. As the film begins, Carlos is working for Blasco (Joaquín Cosio, “Quantum of Solace” 2008). Blasco has finally saved enough money to fulfill his dream of moving back to Mexico and starting a farm. He needs to sell his truck, along with the gardening tools, and would like nothing more than for Carlos to be the proud new owner. Carlos has not only doubts, but also financial limitations. He knows, however, that this is exactly what he needs to have any chance at moving his son, Luis (José Julián), to a better neighborhood and school, a path to more opportunities for success ｰ a better life. The relationship between the father and son are like that of many teenage sons and their father, precarious. Luis’ daily life is one filled with peer pressure and gangs, leaving him on the brink of delinquency. Carlos makes the tough decision to move forward with the purchase of Blasco’s truck with the help of his sister, Anita (Dolores Heredia). What follows is a series of events that will further test the father and son relationship. To get the most out of this movie, I advise not watching the trailer (if you are lucky enough not to have already seen it). Although top-notch, Bichir’s performance is not the only factor that makes this a worthy film. The movie, as a whole, is beautifully rendered. The story is one that takes hold, gets under your skin and refuses to let go, tugging at your heart for days on end. Bottom Line: I saw this movie on a fluke, as a way to kill a couple of hours before another movie screening. Sometimes, we get lucky. I had no intention of writing a review when I bought the ticket. A week and a half later, I still haven’t stopped thinking about it. It is the summer, anti-blockbuster movie I am recommending to everyone. It is a film that refuses to be forgotten. One last thing, take along a tissue, or two.